Record low temperatures swept across the nation last week due to a polar vortex. NBC meteorologist, Kathryn Prociv called it a “historical cold” as some parts of the Midwest were even more frigid than Antarctica. “You’re talking about frostbite and hypothermia issues very quickly, like in a matter of minutes, maybe seconds,” stated meteorologist Brian Hurley. The bitter weather was a danger to many, creating a lot of problems around the country. 90 million people across the United States saw drastic temperatures of or below zero. The cold caused schools to close, flights to be cancelled, pipes to burst, and the deaths of 21 people. Two college students were among those who passed away. 18-year-old Gerald Belz was found outside of his dorm at the University of Iowa. 19-year-old Connor Gage from the University of Vermont was found in a parking lot, with police citing “exposure to cold” and “inadequate clothing” as his likely cause of death. They weren’t the only ones struggling with the terrible weather. Many homeless people either lost their lives or were hospitalized with frostbite. Warming shelters were set up across different cities with the intent to help them face the cold, but not everyone got there. The snow and ice also made driving conditions poor, resulting in a few deadly car accidents. 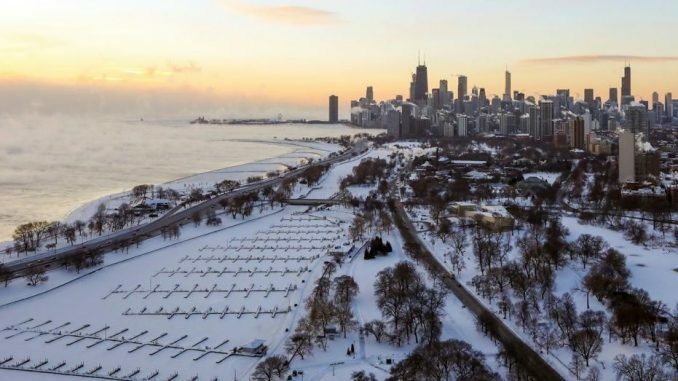 Chicago faced temperatures well below zero, greatly impacting the Windy City. Over a thousand flight arrivals and departures were cancelled on Wednesday at the city’s two biggest airports, O’Hare International and Midway International. On that same day, Amtrak also cancelled all trains going in and out of Chicago. At a local hospital, 50 patients were being treated for frostbite. “It’s a horrific situation,” stated Dr. Stathis Poulakidas after seeing many “horrific injuries to feet and hands.” Some victims could potentially lose limbs as a result. Half of those patients were homeless individuals, who remained largely at risk throughout the week.